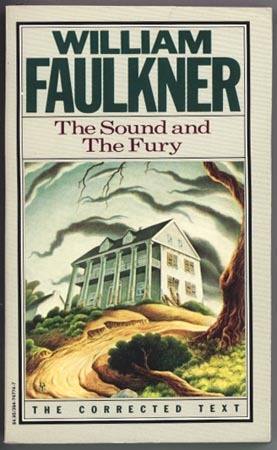 The Vintage Corrected Text mass market copy of The Sound and the Fury I bought for AP English in 1991. I haven’t parted with it since. Publisher: Jonathan Cape & Harrison Smith, Inc.
Faulkner is the king of the list. Does that really surprise you? Before I put up the full Top 100 list (and do the post for #1), I am tossing up this bit of various trivia and statistics about the novels on my Top 100 list and on the 101-200 list. Please note that none of the lists involving 101-200 have numbers attached because I didn’t rank them. 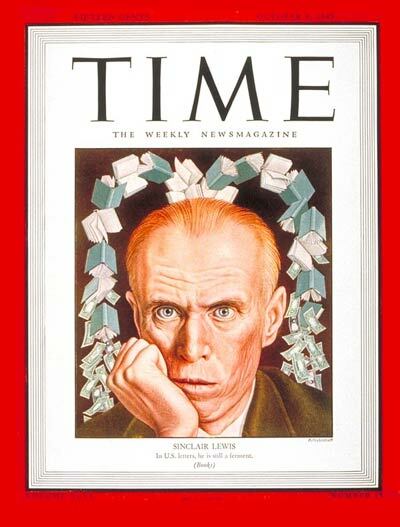 Sinclair Lewis is king of the second 100, with four books. Here he is on the cover of Time Magazine, 15 years after winning the Nobel Prize, yet now he is mostly forgotten or ignored. 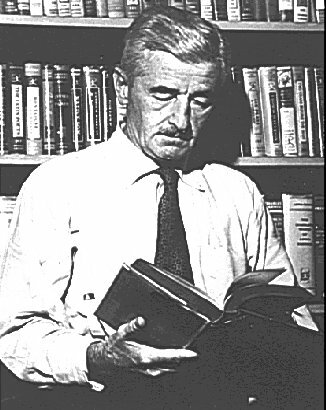 Have you ever read anything by him? This list works a bit differently than the Top 100. First of all, this is not a ranked list. Except for the first three listed titles, they are placed on this list chronologically. Second, I have not been back through each one of these titles the way I have gone through the Top 100. Some of these I haven’t re-read in years while every one of the Top 100 were re-read before I wrote on them. There won’t be individual posts on these books. Think of this list as less the definitive second 100 as 100 great novels that are worth a read. Don’t mistake me. 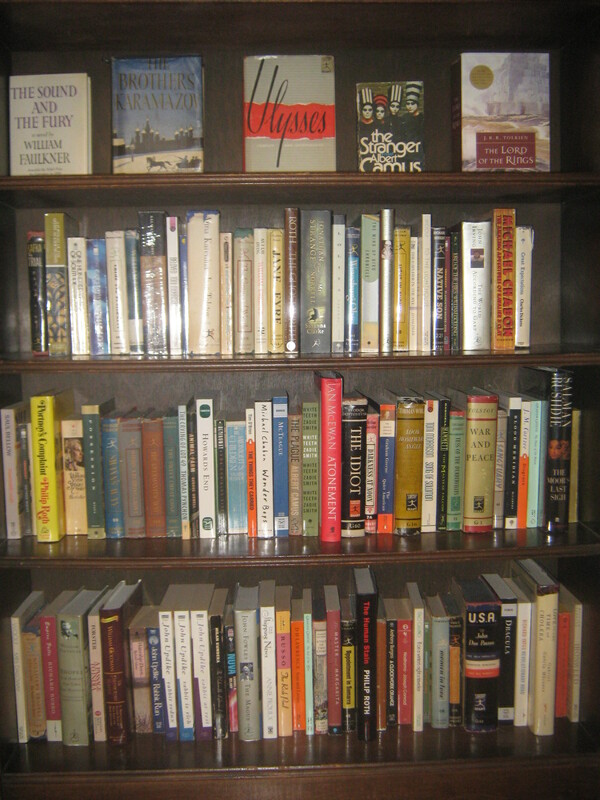 These aren’t just books I enjoy reading. I hope to start a series soon called Great Reads (which will all get individual posts), which are all about the books I really enjoy, but that don’t really belong on a list like this one, let alone the Top 100. These are all great novels (though some might also end up in Great Reads). What about your book, the one you were surprised didn’t make the Top 100 and are even more surprised didn’t make this list? Well, I had to pare it down (I originally typed out over 125 novels and considered far more). Just imagine that whatever book you’re thinking of that didn’t make the list was one of the last ones I cut. Well, unless your book is Infinite Jest, Middlemarch, On the Road or anything by Jane Austen or Henry James. If you thought those might ever make the list you have clearly never read anything else I have ever posted on literature and are probably brand new to the site. Welcome! 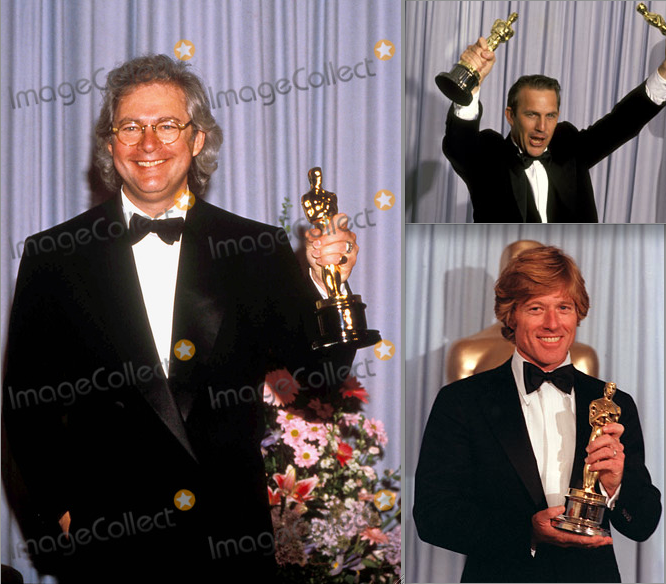 What do these three directors have in common aside from those Oscars they’re holding? Well, in spite of the fact that they’re all ranked at least 70 spots lower, all of those Oscars were won in direct competition with Martin Scorsese. Here be group, I don’t know, 6 or something. It’s the complete ranking of all the directors ever nominated for Best Director by the Academy Awards. This group covers #100 – 76. As always, there is an introduction and there is an explanation for the rankings, which are contained here. I feel the need to point out that while this is a work in progress, I don’t re-rank anyone who has already been ranked. That will all come when I redo the whole list at the end. As with all the groups, there seem to be a few themes here. One of them is the television creators – this list not only has James L. Brooks, famous for winning a gazillion Emmys for shows like “The Mary Tyler Moore Show”, “Taxi” and “The Simpsons”, but it also has Michael Mann (who created “Miami Vice” long before his Oscar nomination) and Barry Levinson (who created “Homicide” after winning his Oscar). There are also a fair number of directors on this part of the list who were nominated for their debut feature (Gilroy, Miller, Costner, James L. Brooks, Redford), three of whom won the Oscar. And of course two of those are actors-turned-directors who won an Oscar over Marty Scorsese (the other one is Levinson). A reminder about the quotes: The Sarris quotes (and categories) come from The American Cinema: Directors and Directions, 1929-1968, which was published in 1968, so it has no directors after that. The Thomson quotes come from the 2002 edition of The New Biographical Dictionary of Film, (none of my quotes in this part of the list come from the 5th edition). 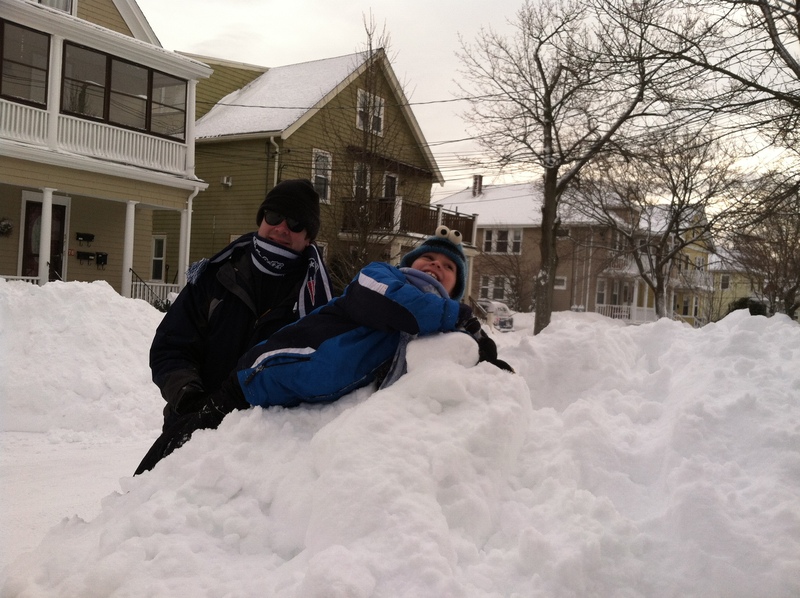 Thomas and I on a snow pile. Veronica took the picture and stayed far from the pile. Well, for once the weathermen in Boston were right. We got a blizzard. The picture on the left is partial proof. This powerpoint (BlizzardFeb13) is more proof. We got closer to three feet of snow rather than two. But, with the drifts, as you can see when you get to the first picture of the car, it went closer to five feet. Also, our upstairs neighbors did a timelapse video which you can see here. But, two days in a row home with Thomas and Veronica – can’t remember the last time that happened. I love the snow. 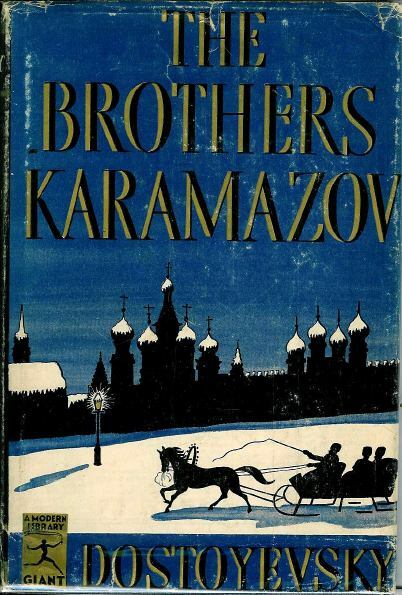 The original Modern Library Giant dust jacket for Dostoevsky’s The Brothers Karamazov.